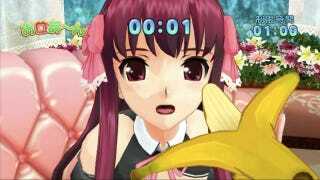 Dream Club Zero features a mini-game in which players feed bar hostesses bananas and sausages. It's latest mini-game, however, is cold and creamy. The latest addition is a timed mini-game in which players feed bar hostesses ice cream. Players that don't succeed in successfully feeding the girls will cause white dribbles all over their faces. Some players are bound to have different definitions of success. Dream Club is developed by Tamsoft, the folks behind the Onechanbara bikini-cowgirl games. The latest entry in its nascent hosting franchise, Dream Club Zero, is delayed and will arrived on the Xbox 360 sometime early next year, ice cream stains and all.